Is the technology services that offers Public Institutions and Police advanced platforms and innovative outsourcing services for the improvement of road safety standards. The digital system that particularly suitable for the control of main and secondary extra-urban road sections, in automatic mode without immediate objection. The solution proposed for the medium speed control consists of one or more pairs of detection peripheral stations (portals) adapted to identify breaches. The TITAN© platform receives data and images relating to the infringements found by a plurality of detection stations, and offers modular services that enable the Public Authority the complete management of a sanctions process (from ascertainment up to the technological support for the collection). At the passage of vehicle, the laser sensors activate the cameras placed on the portals. The first sensor detects the car category and activates the cameras filming the license plate, the time and date of passage, while the other detects the vehicle and activates the cameras filming the license plate and record the time of passage under the portal. Scout Speed is the new in-car system device approved by the Ministry of Transport for detecting the instantaneous speed of the vehicles, designed to be installed on board of police cars. Allows Detection of speed in motion, up to three lanes. Is a system composed of 1 fish-eye camera and 4 photoelectric cells. People crossing the stripes activates two photocells, which operate the 4 high brightness flashing light installed near the pedestrian crossing, and the two outermost placed 70 meters before the crossing. The driver is alerted and begins to slow down. Is a system which detects steps through a red light automatically producing, a detailed and comprehensive digital documentation of infringements. This system allows the image capture of moments before, during and after the infringement and taking advantage of a clear vision of the dynamic. The verification of associated data, providing the use of digitized images of the vehicle that has committed the infringement. Is a system for the detection of exceeding the speed limits in automatic mode using a laser sensor, with low infrastructural impact and non-invasive. For installation on roads with different limit for different types of vehicles, a special laser sensor is used for vehicular classification. The system has a very high accuracy in detecting the speed about ± 2 km / h for speeds up to 150 km / h of approximately ± 3 km / h for speeds between 150 km / h 265 km / h.
The system allows the detection of excessive speed out of a total 4 lanes independently of one another. Violations are detected simultaneously, and the system can distinguish the individual lanes detecting where the speed excesses. In extreme case, even four vehicles in simultaneously violation, both in the same direction of travel or with different directions, can be detected and related to each photo-gram documentation describing its own speed as well as an indication of the lane where the offense occurred and to which the image relates. Is a great tool for monitoring and compliance with the rules of access in areas with limited traffic and the only integrated system that allows you to manage temporary access for institutions, merchants and residents, as well as differentiated by vehicle class, in connection with Vehicle registration Database. Is an approved system for controlling access to Limited Traffic Zones based on automatic reading of vehicle’s license plates. The access gates control system acquires images of the vehicles in transit and transmits to the central control system an image with place, time, identification (license plate number) of non-authorized vehicles. Is proprietary platform for the management of information on car accidents. The platform is designed to provide the Police a versatile tool for accident report, in electronic format on Android tablet. Allows the creation of an accident files in PDF format and their distribution through a portal with access restricted to insurance companies, leading victims and third parties involved and with this information it will be possible to attend by improving the signs, installing speed detection devices and putting in place all those targeted measures to reduce the risks arising from circulation. It helps the Competent authorities to collect in a precise and intuitive way all useful details on dynamic, context and characteristics of each road accident. 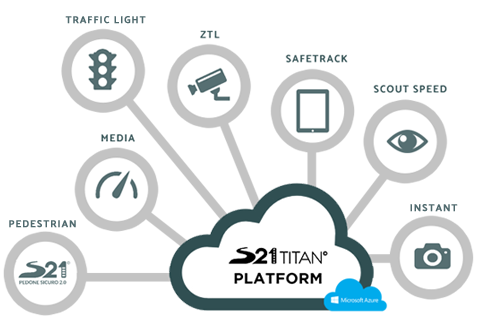 Is the proprietary leading technological platform through which Safety21 provides scalable outsourcing services to Public Body in terms of road safety, sanctioning and collection support. Is able to manage the whole cycle of sanctioning infringements of the Highway Code, it is accessible via web and compatible with different systems Certified by the Ministry of Transport, in accordance with current law.